Before last year I had never seriously played a social game. I was never interested in Bejeweled or Farmville (as the later just seemed to be a lazy version of Harvest Moon to me) or any other Facebook/mobile game. 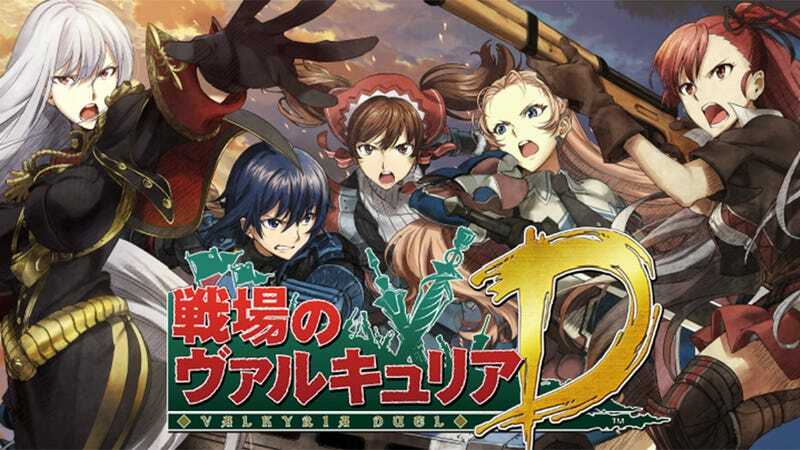 Then last year I wrote about Valkyria Chronicles 3. If you have read those articles, you know it is safe to say I am a huge fan of the series. And so around that time, I picked up the social game in the series, Valkyria Duel. I played it for a few days, wrote about it, and then unlike the other mobile or social games I’ve dabbled in, I continued to play. For nearly six months I played. Let’s be clear, there is nothing special about Valkyria Duel as far as games of this type go. You get cards, build a deck (squad) and then fight other people’s squads and computer-made bosses. But as all the fighting is automatic, all you really do is determine the strategy by building the squad and picking who they should fight. The game wouldn't really be all that addictive, if it weren’t for the events. Every 15 days or so, there is a game event. And along with the events come a slew of new cards. These event cards, instead of using character art from the games, have new special portraits for the characters. This means that you’re playing for professional-grade fan art, and I am, without a doubt, a fan of quality game art. Of course, getting the coolest special event cards requires you do one of two things: use a credit card or consistently be in the top 500 players by joining a top tier guild. Somehow, over the course of playing, I managed to buy nothing. But this was only because the real world cost for a pack of random cards started at $3, and to have a chance at the rare event cards, the packs cost $60. So that left the other option, a guild. By the end of my time playing, I was spending 12 hours a week during special event times (four hours long) “raiding” with my guild. The first thing I did when I woke up each morning was upgrade my base. In my bathroom or on the train, I would play a few battles. When at home I would be playing constantly in the background regardless of what other games I was playing or what anime I was watching. I’d like to tell you I realized how stupid it was that I was spending as much time each night on this card game as I had ever spent doing forty-man raids in World of Warcraft. Or that I knew I was addicted to the damn game and quit on general principle. But that’s not the truth. The truth is I quit because I wasn’t obsessive enough. The guild I was playing Valkyria Duel with was the best on the server and they took it very seriously. Each day they handed down new rules as to how to best attack each of the bosses and how to spend your resources to best help the guild. I simply couldn’t keep up. And after one mistake too many, they booted me. I was livid—and more than a little embarrassed. No one likes to find out they just aren’t good enough at something. So for a day or two, I dabbled with the idea of joining a new guild and then convinced myself this was all for the best and quit cold turkey. It's kind of amazing how much the stress in my life has decreased since I quit playing. I suddenly have free time for other console and portable games that I would have had to ignore—not to mention just having time to relax. The thing is, even now, I still want to play it. As I said when I talked about my similar drive to collect trophies, I like to master a game—to do everything there is to do. But of course a social game like Valkyria Duel has no ending. Even now there are more pretty pictures of my favorite characters I could be collecting. And it doesn’t help that every YouTube banner ad on my computer seems set to remind me to play it. But I am done, and happy I am done with it. Though even now I dread the idea that it’s only a matter of time till the next social game will come and drag me along.